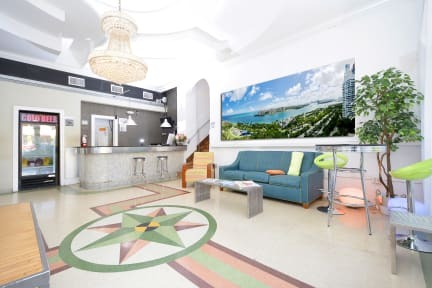 Original Art Deco building, The Hostel in South Beach has been recently renovated in its common areas and rooms with nature inspired decorations from local and international artists. We include free breakfast and dinner in our “underwater” playroom, together with daily activities that’ll make your holiday a unique experience… with our staff available 24/7 for you! Located in the heart of the historic Art Deco District, one block from Ocean Drive and the beaches and a stone throw from all the vibrant bars and clubs of the Magic City: relaxing stay or non-stop parties…the choice is yours. Framed by its neons and palm trees and crowned by its never-ending summer, Miami represents the hub where South American culture meets the Northern one, making South Beach the ultimate spot for sport, music, beach and party life, all year long…and The Hostel is right in the heart of it. And after a “busy” day, enjoy our recently renovated dorms with en suite bathrooms and air conditioning. They also all include free lockers and a cupboard to have all your belongings handy. Taxes not included - 14.00%. Service charge of 2 USD per night excluded from the final price. We only allow people 18 - 55 years. 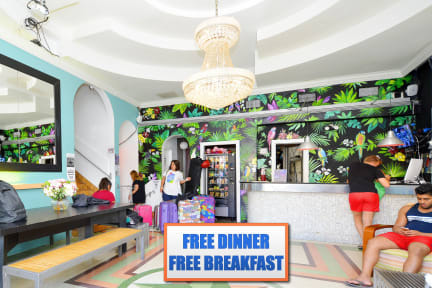 Hostel, e como todo Hostel tem suas qualidades e defeitos, porém nessa experiencia em Miami Beach parece que tudo resolveu sair da melhor forma, fui muito bem atendido pelo Bruno na recepção, inclusive falando um belo português, fiz o check in e pronto, tudo resolvido, o quarto tem 6 camas, um banheiro e muito espaço para não ficar se sentindo preso. Café e jantar agradáveis e que valiam a pena pelo valor e por ser hostel. muito próximo a praia, baladas, mercados, restaurantes. Gostei muito.